I’ve got a wicked case of the Mondays. 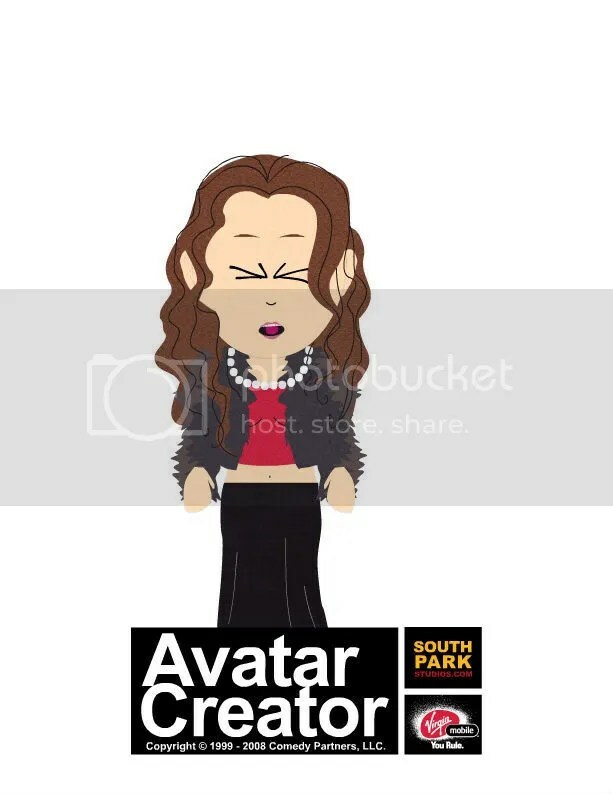 I discovered this avatar creator while secretly watching South Park episodes off the website at my desk at work. And a reader submission from Christopher: ENID! OMG I laughed so hard when i saw these!! I love it!! Is the guy Bruce or Todd??? BEAUTIFUL! And totally effed up, btw! OMFG… thank you so much for that much needed laugh this morning! The guy is hilarious as either Bruce OR Todd!! And Liz… LMAO… these are all priceless!! oh man, I have been dreading my return to work after a week on da beach. I got sick of sorting ten trees worth of paper real quick and decided to take a trip to the burger to clear my head. I am guessing that is bruce, based upon the sweater around the shoulders. very top drawer. WOW! bruce is wicked. i lovw lila, too. omg, share your Enid! I’ll post it. Email it to me. The last one was supposed to be Bruce. Hence the date-rapey look, the white chinos and the sweater. I am especially proud that Jess is wearing her lavaliere. Liz is not because Suzanne stole hers. 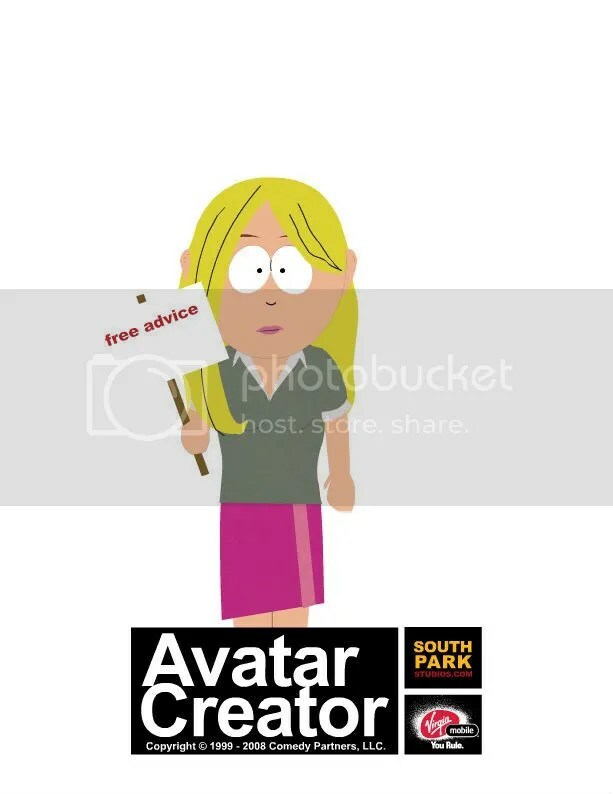 I could not find your email addy So i posted it in my photobucket account. Yipes, didn’t work. My address is thedairiburger@gmail.com. Haha, is the last one Oliva Davidson? Awesome. 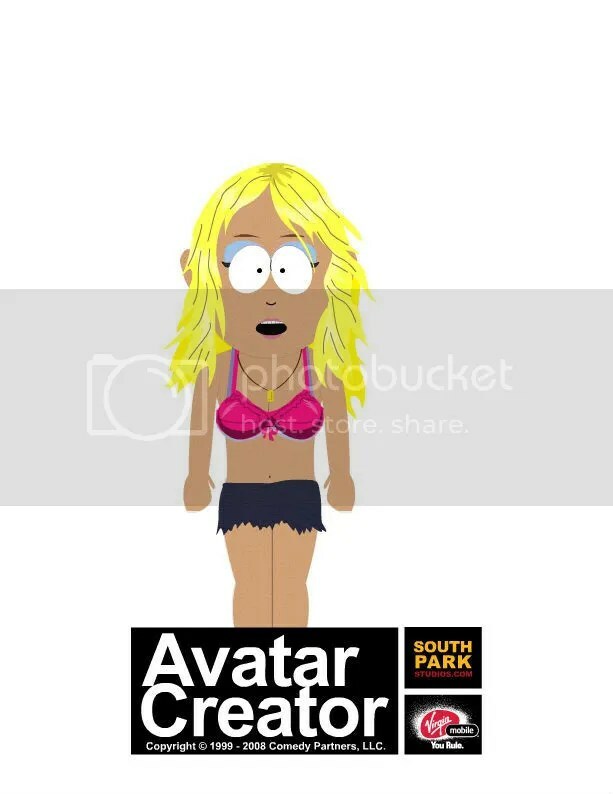 I also love that, apparently, you had to use the “Latina” setting to get the Wakefield’s tans right. Too awesome. Oops — Oliva = Olivia. Doy, I feel dumb. I would have thought the one with the peace sign is Olivia. 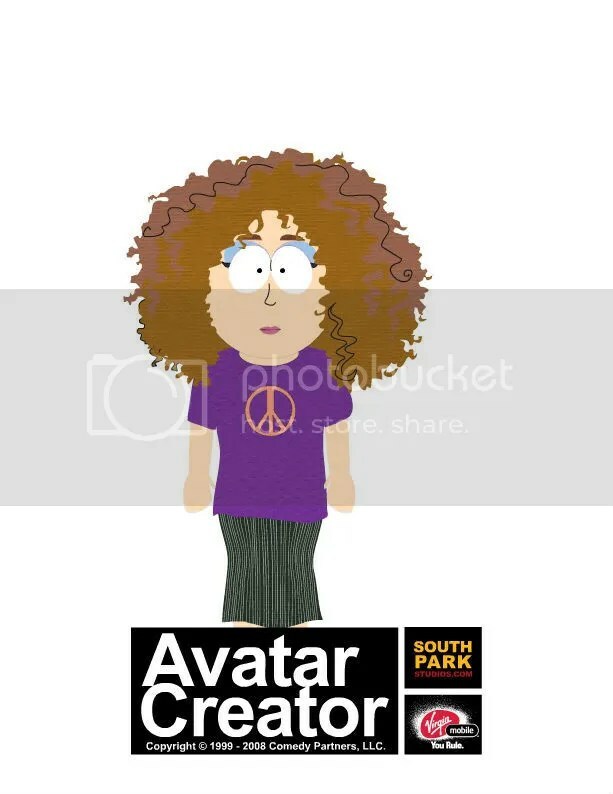 Isn’t she the hippie? With frizzy curly hair? I have no idea who the last one is supposed to be. Actually, I used the “gay tan” option. These are awesome! Jessica totally looks like she’s on drugs (or maybe she just gets high on ruining people’s lives). No idea who that last one is, but she seems to have applied fake tan to her legs! The last one is not fake tan it is a two-tone skirt. 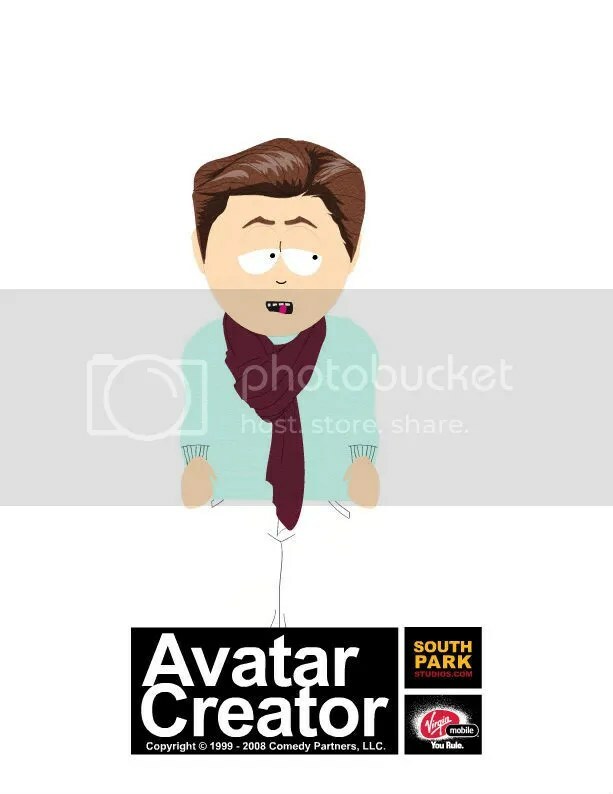 I love this character creator! I have come up with characters for each of my moods and for certain days of the week. Liz looks like Paris Hilton in the “Stupid Spoiled Whore Video Playset” episode. 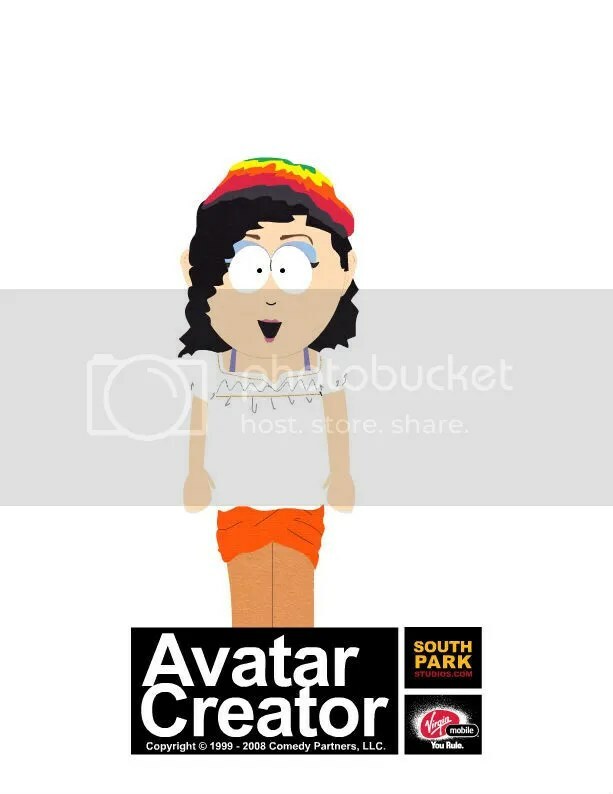 Man, do I LOOOOOVVVVEEE South Park. Liz kinda looks like a younger blond version of Ms. Choksondik though. I thought Enid had the FRO and Olivia just had curly black hair. Aw man, I did a great on of Lynn the Musician pre makeover, but I can’t figure out how to save it or send it to you! Someone who’s good at this kind of thing, help! The last one is Olivia Davidson. Haha Christopher, thanks for clearing up the two-tone skirt thing 🙂 Though I still like the idea of one of the Sweet Valley residents being *gasp* pale enough to have to fake it. I just remember Enid on the cover of Crash Landing! when she had the fro. That is my lasting image of Enid.